One of the happiest moments in my life happened in the month of September. It was during this month that I said "I do" to the man that God gave me. The date was 9/11/02, just a year after the tragic event that devastated NY. It's been 14 years now that I've been married to my hubby. We try to celebrate our anniversary every year. Last year, we spent the night in a beach resort and dined in their restaurant in my homeland. This time, we are in Texas so it's just a very simple celebration. I didn't even celebrate my birthday here. We have to be frugal because our dollar is not multiplied here unlike in the Philippines. Besides we are saving up so we can buy our tickets and go back home. 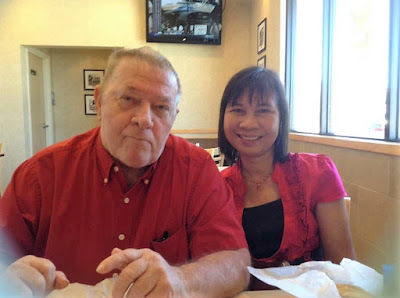 We went to church to worship the Lord with Sherry and then after worship service we went to eat out. I wanted to go to Golden Corral, my fave buffet restaurant but hubby said it might be full and busy being Sunday. So we just went to Dairy Queen and ordered hamburger meals. We did not really get full but it's good so we will not gain more weight. Then Sherry drove us to Fort Worth and went to a museum. I am not really very fond of going to a museum, I would rather go to a park, garden, lake or beach. In fact, I wanted to see the Sundance Square and The Stockyards but hubby don't wanna walk so we ended up going to the Amon Carter Museum. We will just go back to see those two places I mentioned before we leave. I hope. The Amon Carter Museum of American Art showcase beautiful collection of paintings from many different artists. The frames are exquisite and a piece of art themselves. Great presentation of the pieces. Quiet and meditative, Best of all, admission is free and so is parking. The only downside is, they don't allow flash in your camera if you want to take pictures of the paintings. I was able to take couple of pics with flash before we were told. Before we left, hubby asked one of the employees why they don't allow flash in the camera and she said that bright flashes of light can damage paintings over the long term. Well, I did not know that. At least they allowed photographs taken but no flash. I just edited my pics so it's not too dark. At least they came out fine.